Self-adhesive backing is easy to place. 3M self adhesive provide extra strength and durability. Stainless Steel construction, ensuring quality and longevity,heavy duty design. Premium strong quality adhesive by 3M and protects against water. This towel bar is safe and secure on ceramic, stone and mosaic tile, shower enclosures, glass shower door, great for using in bath, kitchen, laundry room and patio. The contemporary stainless steel designs of housewares lend well to any décor. desired position, recommendation after 24 hours, hanging objects will be better. apply it to the wall or other places, it is not easy to remove. If you want to apply to the wall, especially the gypsum surface, please choose the position to stick with care before use. Simple and classic design and it looks great. Easy to install, and strong adhesive.Just make sure you line up the angles correctly, because once you press it onto the wall, it's going to be in that position! You can`t move it anymore. Size: 15.75*1.77*1.97 inch. Perfect for hand towels and wash clothes - Classic 3M quality, on an attractive towel bar. Easy to install and looks very modern and attractive in bathroom (must be smooth surface ,like ceramic tile, metal surface ,glasses, etc.). Don't want to put nails in the walls? This towel rack you just need to take a minute to stick it, no need to drill holes. This towel bar works very well for a single hand towel and was able to mount it within easy reach of the bathroom sink.The extra hook can meet your other organizer need, making you convenience to hold your watch or other small items when you take shower. The simple design would work in any decor.Installation is very intuitive and easy. Adhesive is very strong. It looks as good as the other high end fixtures.Suit for your bathroom,kitchen, badroom, living room. Space Saving - This towel bar save valuable space, so you spend less square footage on storing, and more on living. 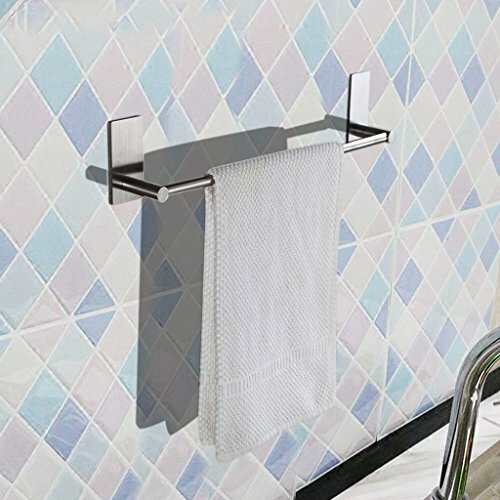 This self-adhesive towel bar firmly adheres to any flat surface. Works well with dish towels, washcloths. Instant space saving. Please kindly check size before you purchase. Thank you!